Finding the strength and make of reed is a highly personal quest. 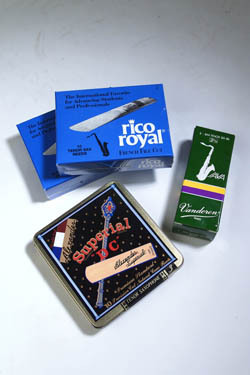 Rico/Rico Royale ,Vandoren Java, Marca and Alexander Superials. 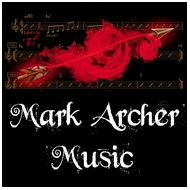 Mark Archer, Blowout Sax’s founder and director, has always been a Rico man. As Dexter Gordon famously said in the film ‘Around Midnight’, ‘Happiness is a wet Rico reed’. Over the years I’ve used Rico, Rico Royales and Plasticover Rico reeds around the number 2½ to 3 depending on the depth of sound I’m looking for. I have played since new a 1988 Selmer Series 2 alto sax, and for 20 years a Peter Ponzol 007 mouthpiece. Now I use a King Dave Guardala with a Plasticover black Rico 3 or 2½ and/or a Rico Royale. When I fell in love with the tenor it was with a 1971 Selmer Mark VI with a studio model Dave Guardala mouthpiece, with a 3 Rico Royale and when I want the sound to rip a 2½. Equally Jackie Greenwood of Blowout Sax uses Rico plasticover no. 3 reeds when playing her Yamaha YAS-62 alto saxophone and a Lawton 6* BB mouthpiece. 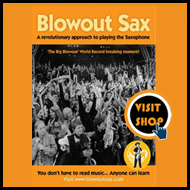 Blowout Sax’s, Craig Crofton is a Vandoren Java reedman number 2.5 strength when playing his vintage tenor Conn pink lady 10 M and original handmade Michael Brecker Dave Guardala mouthpiece. Likewise Berry Goddard uses Vandoren Java (green pack) reeds 2.5 trimmed up to ~3 strength when playing her Selmer model 26 tenor with a Lawton 8*B mouthpiece, size 2.5 or 3 when playing her Yamaha alto with Meyer 7* mouthpiece and size 3 when playing her Yanagisawa 991 straight soprano with Yanagisawa mouthpiece. 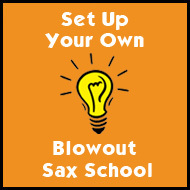 Stan Scott of Blowout Sax uses two brands of reeds – Marca Jazz 2.5 and Alexander D.C. 2.5. Both of these brands are produced from cane grown the Var region of southern France. Cane from the Var is the champagne of reed materials. Such reeds have a full depth of response and wide spectrum of tone. Always soak your reeds for around half an hour before you start playing them and remember every reed is individual like every sax player so play a few consecutively to find the magic ones . Reedguards are well worth having as you can have a number of reeds at various stages of play and when your ear becomes more finally tuned you can locate the right reed for the right type of music. Soak your new reeds first, put them in a reedguard case and alternate to make sure you are breaking them in. But be clear in labeling your reeds, otherwise you might misplace your favourite reed in amongst the others. There are a number of reedguards out there, but 2 particularly useful ones are the Rico case with a reed reviver pack and the Vandoren Hygro.